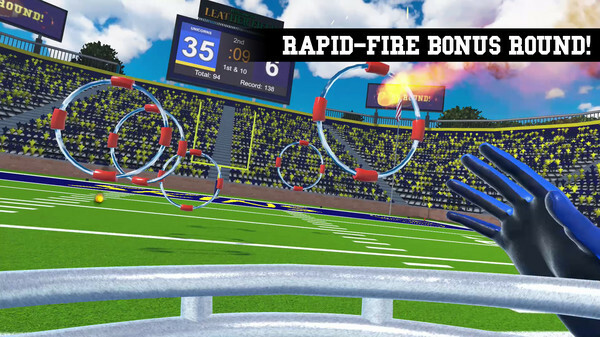 2MD VR Football, from Truant Pixel, is a game that, like Space Pirate Trainer, has a great old-school arcade feel while updating the gameplay, graphics, and responsiveness for VR’s capabilities. The concept is simple: you’re the quarterback of your team, and each game is a 2 minute drill. Throw the ball downfield to your receivers and advance along the field to score, and then take on a bonus round to perfect your accuracy and speed. A 3rd person spectator view is included for those watching on TV. Spectator mode, which shows on the TV out of headset, allows for a nice viewing experience. This game scales difficulty pretty well. If you just want to hop in and test out how throwing a VR football feels (the answer is: very realistic), then you can do that easily. However, the game also allows you to shift your receivers and draw your own plays on a whiteboard if you’re interested in the details of passing plays. You can also choose to audible once you’re on the field. As you might expect, the most fun moments for players tend to be scoring those touchdowns, or completing long passes on 4th down. If it’s a good football moment in real life, then it will feel great in VR. Getting in a rhythm in the bonus round and hitting those hoops one after another is also satisfying. Those who are into football or sports in general are the most likely to hop in and enjoy this. Because of the scaling difficulty, we’ve seen both kids and adults love this game. And yes, it works for both left-handed and right-handed players: this picture shows a left-handed player surveying the field and preparing to launch a pass. 2MD VR Football is a good example of VR allowing people access to a real-life situation that is hard for most people to get into in real life. Not everyone is built to play football or has the skill of a quarterback. But, in this game, anyone can feel the thrill of throwing that perfect spiraling pass into the end zone.